It’s Vodka Not Vodika | "It's Not Wine, it's Mommy Juice!" This conversation took place in the car. Of course. Look! I can drive, say cheese, and take a photo of all three of us at the same time! *Smile* Actually, we haven't even pulled away from the house yet. Mgazi: How old do I have to be to chew gum? Me: Because I said thirteen and it sounds like a nice number. Would you prefer fourteen? Mgazi: Yay! We can chew gum when we’re fifteen! Mgazi: How old do I have to be to drink wine? Me: Because twenty-one is the legal drinking age. If you drink any kind of alcohol before you are twenty-one, you are breaking the law. This will make the police officers mad. This will make your mommy mad. Mgazi: How old do I have to be to drink soda? Me: Because soda is bad for you. It’s only good when mixed with alcohol. 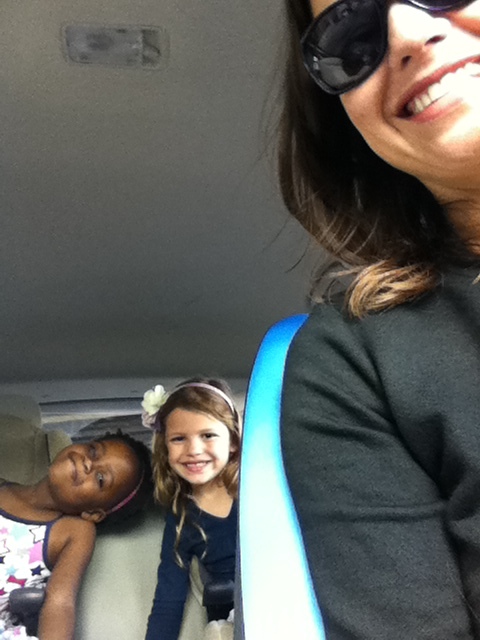 This entry was posted in My Funny Kids and tagged in the car, lazy parenting, Mgazi, questions, Zaffron by Kristine Castagnaro. Bookmark the permalink. Heehee! I love your mommy vignettes.